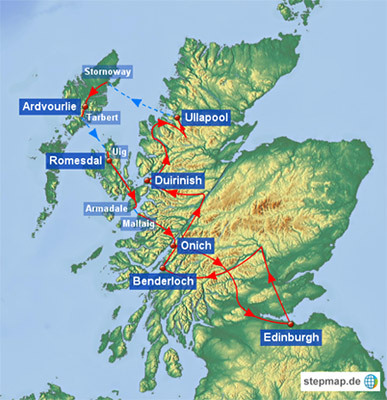 Since we prefer not to change accommodation every day in our holidays we decided to visit only parts of the Northwestern Highlands and the Hebridean Islands Lewis & Harris and Skye. In our opinion these parts of Scotland best represent the wild and rugged side of the country, and I have been looking forward to visiting the Western Isles with their white beaches for years. Our journey started in Edinburgh, where we spent 3 nights and watched the famous Edinburgh Military Tattoo. After that we collected our hired car and headed for the Highlands, having reserved all our B&Bs in advance. Some of these were working crofts with Highland cattle and sheep, and we stayed 3 to 4 nights at each place doing day trips and hikes.